A lack of accessible, policy relevant and targeted information on the climate and potential future climate change remains prevalent in many regions of the world. This can act as a hindrance to many investments and scientific projects, where proving the level of a project’s susceptibility to climate impacts is now often mandatory for consideration and approval. To meet this identified information gap, the Climate Service Center Germany (GERICS) has been developing tools which allow the presentation of policy relevant consideration and approval. While access to general climate change information might not be problematic for end users there is a high chance however, that they are overwhelmed by the information available and struggle to interpret the information. Issues regarding multi-model-multi-scenario ensembles of climate change projections are rather complex and often not taken up by the end user. It is important to look behind the pure climate change information and include meta-information like the size of the ensemble, the number of different emission scenarios, the spatial and temporal resolution of the data, the design and quality of the models etc into the interpretation of the results. In order to do this, expertise in the handling and interpretation of climate model output is necessary, which cannot be expected from the standard end user. This therefore leads to the situation that the rate of up-to-dateness of the climate change information used in the decision making process is directly linked to the personal knowledge and enthusiasm of the individual end-user. This could lead to the fact that in the end the climate change information is not comparable between different projects within the same region or context. 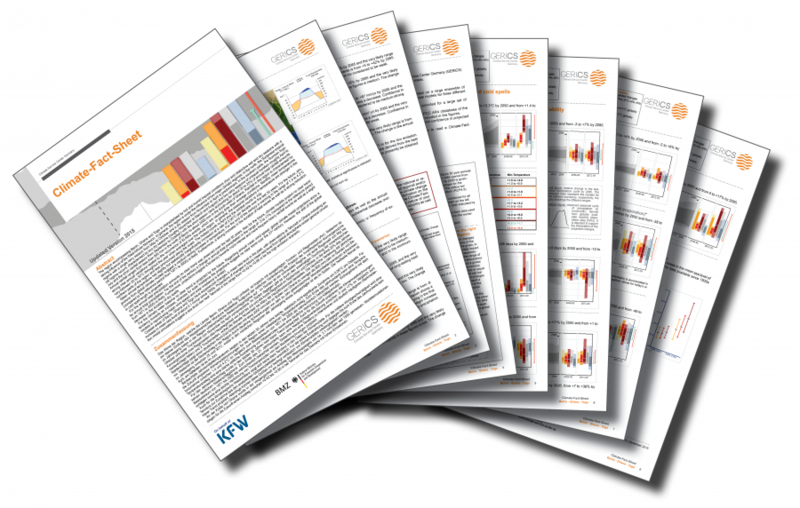 On the basis of the need of consistent climate information the Climate Service Center Germany (GERICS) together with the KfW Development Bank jointly developed the concept of the Climate-Fact-Sheets (CFS). The Climate-Fact-Sheets summarize projected changes for a variety of different climate parameters on the basis of countries or regions. 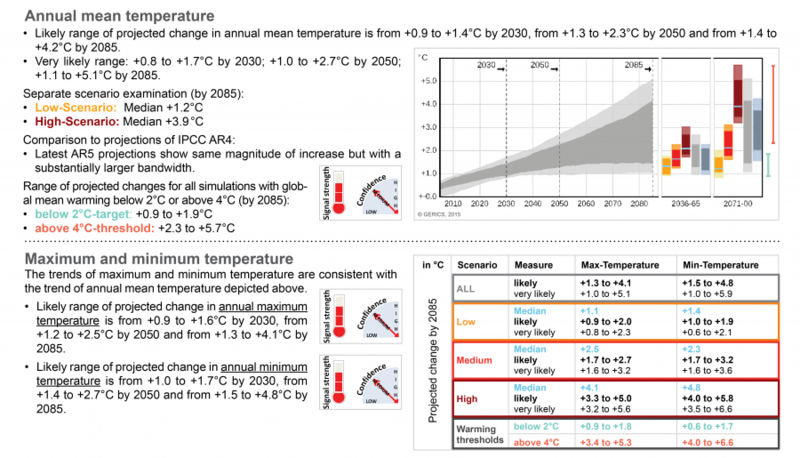 The climate change information is taken from the latest multi-model multi-scenario ensemble of global and regional climate projections in order to highlight changes under different emission pathways. This allows projects in science, industry and finance, which take place within or across different global regions, nations, or climate zones, to quantify projected changes for different climate variables, and comparable worldwide. Additionally, the CFS provide statements on the climate history of the targeted area, as well as both general and key climate characteristics of recent and current time periods. This gives the reader a broad understanding of the specific climatic backdrop to which they look to work within. The main focus of the CFS is providing concise analyse on projected future climatic trends. These trends concern each of the climate indices on the basis of three 30-year periods until 2100. The creation of the Climate-Fact-Sheets emerges through careful analysis and compilation of a large amount of data available from both regional and/or global model simulations. Information for the CFS is gathered from two sources: primary data, such as projections from global and regional climate models or continental wide observational datasets, and a literature review. Where possible, focus is provided on uncertainties and the robustness of projectes changes, respectively. References are also available to follow up on the information provided. Each Climate-Fact-Sheet delivers standard information on the following climate parameters: annual mean, minimum and maximum temperatures, heat waves, cold spells, total annual and mean monthly precipitation, dry spells, intensity and frequency of heavy rain events, actual evaporation, climatic water balance, mean solar irradiance and mean wind speed. Additionally, if appropriate, changes in mean sea level are included into the Climate-Fact-Sheets. The accessibility of the information is essential, and so the CFS are provided in compact forms, usually five to six pages long, and are compiled of short text passages, tables and diagrams. Combined, the overall result is consistent, reliable and easily accessible climate information. Currently 58 CFS have already been compiled by GERICS. These are readily available and accessible, and span contries and regions across eastern Europe, Asia, Africa and Latin America, focusing on developing countries and regions. The CFS are provided free of charge by GERICS. For more information about them, including how to access your own fact sheet, please visit our website.